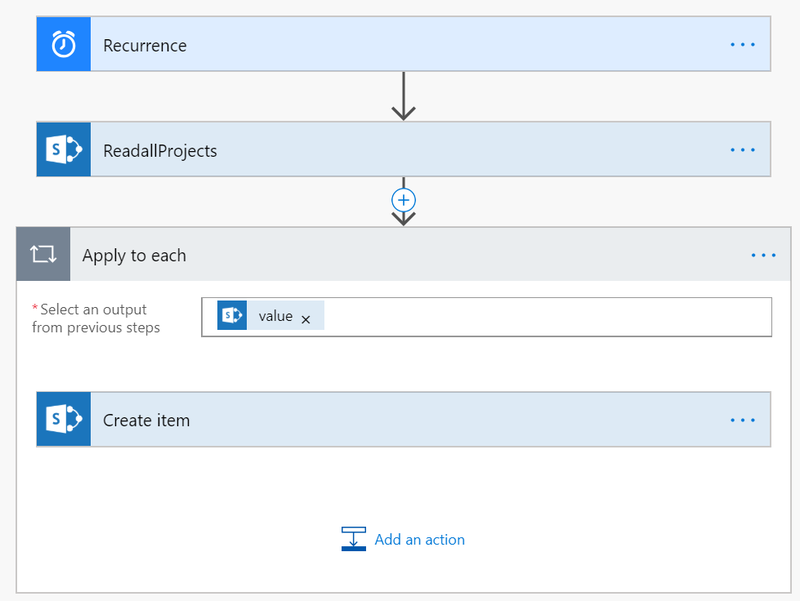 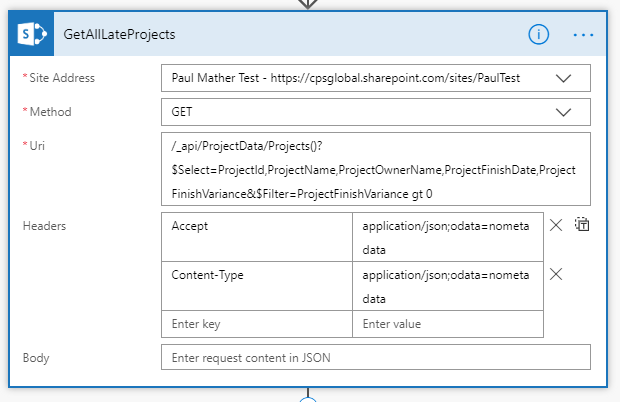 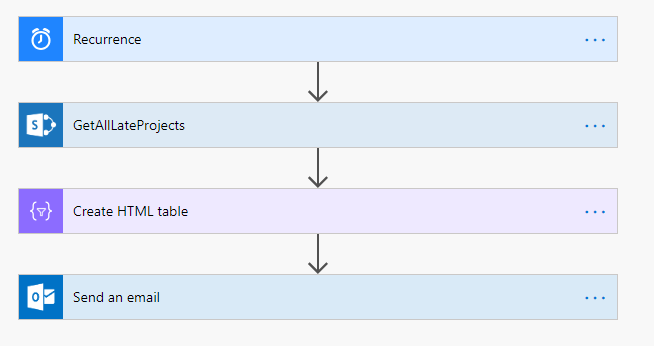 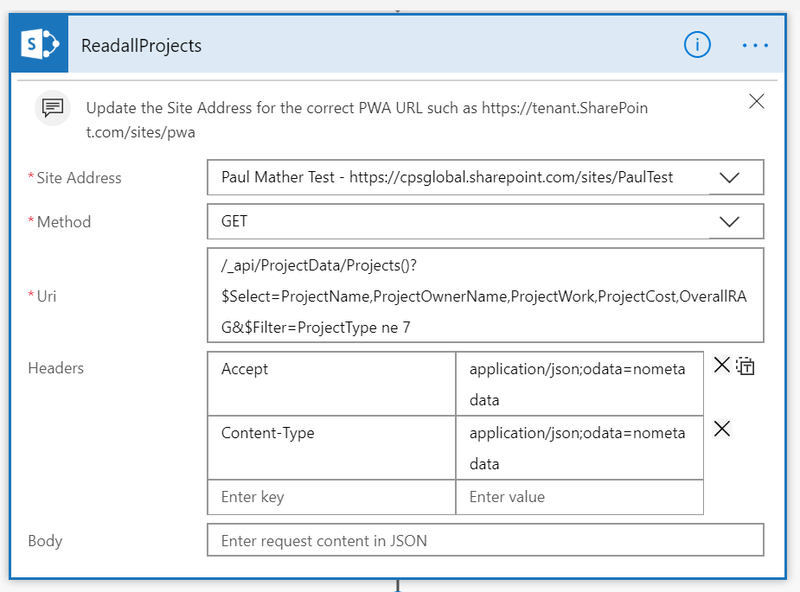 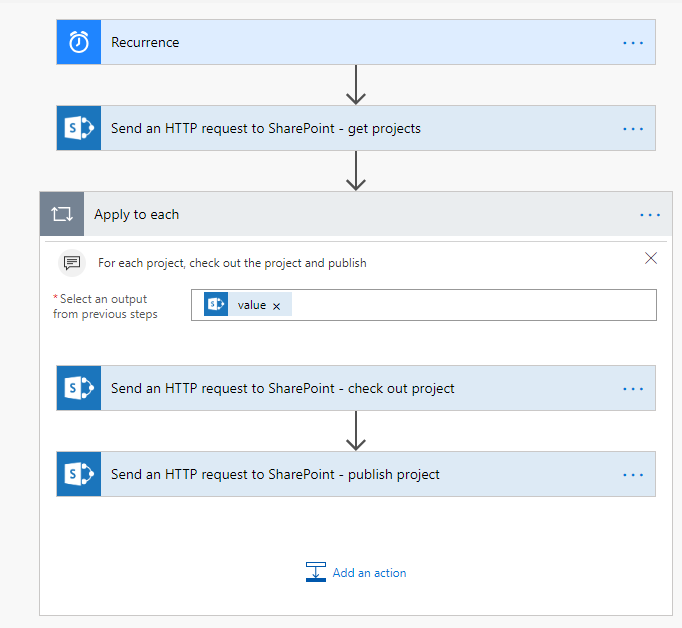 This simple example makes use of the recurrence trigger to schedule the process, the “Send an HTTP Request to SharePoint” action to get the project data from Project Online and a SharePoint create item action inside an Apply to each loop. 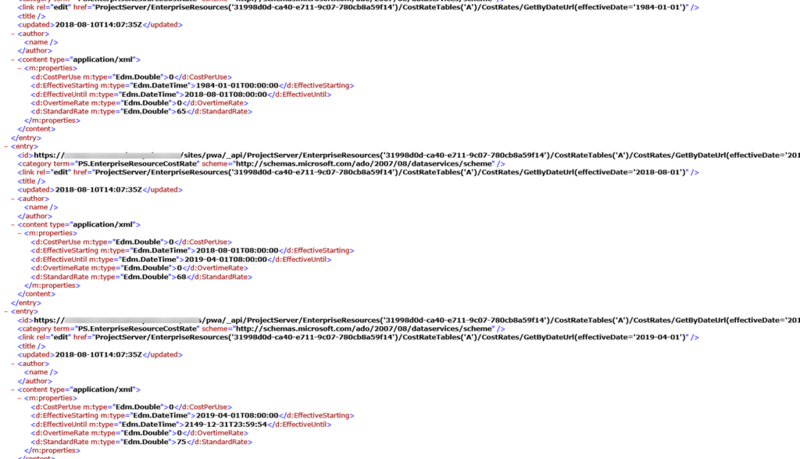 We will walkthrough the actions later in the post. 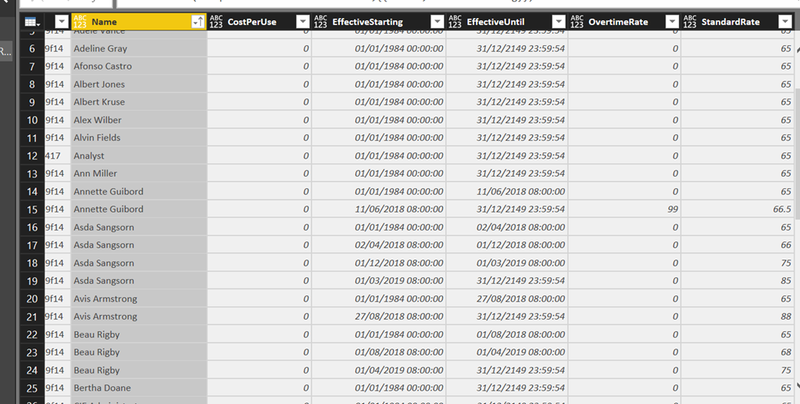 In the output from the previous step we use body(‘ReadallProjects’)[‘value’] to use the data from the previous step which is all of our Project Online projects with some data minus the timesheet project in this example. 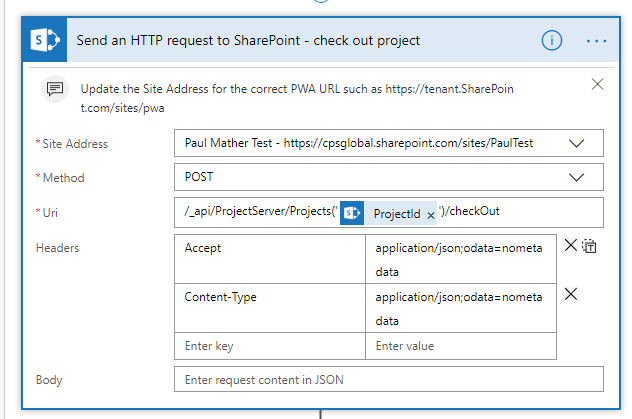 Then for each project in the array we create a list item on our target SharePoint list using the create item action. 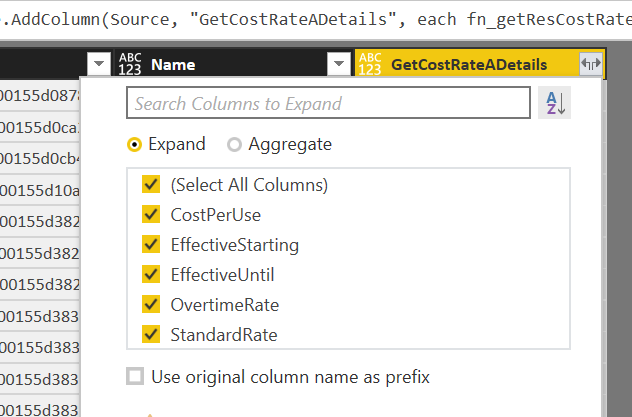 In the create item action we just map the data from the array to the correct list column. 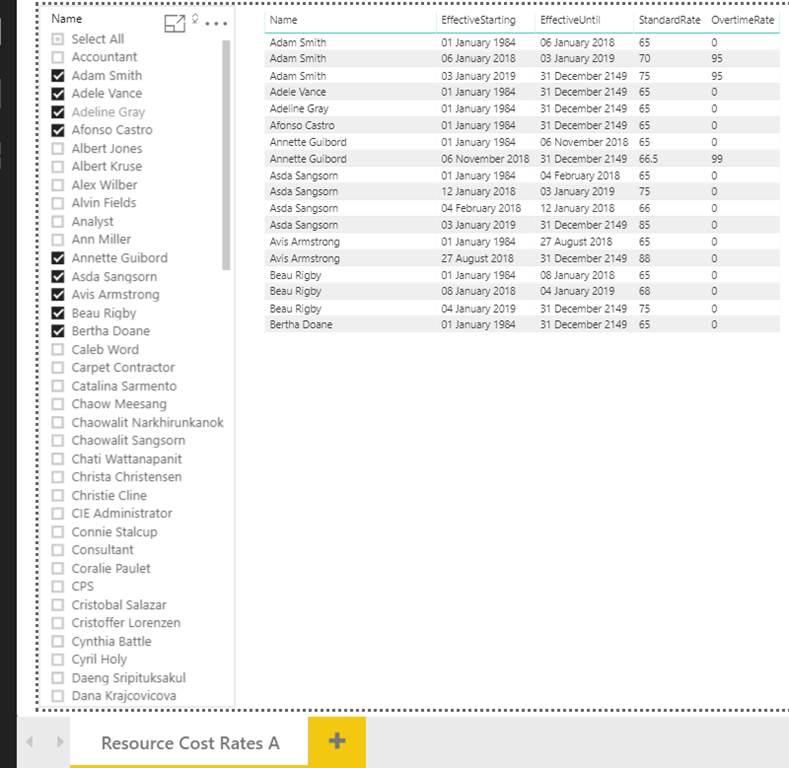 The Project Online fields are accessed using an expression, for example for ProjectCost in this example Flow the expression is items(‘Apply_to_each’)[‘ProjectCost’] where apply to each is the name of the action and ProjectCost is the field / property in the results from the Odata query. 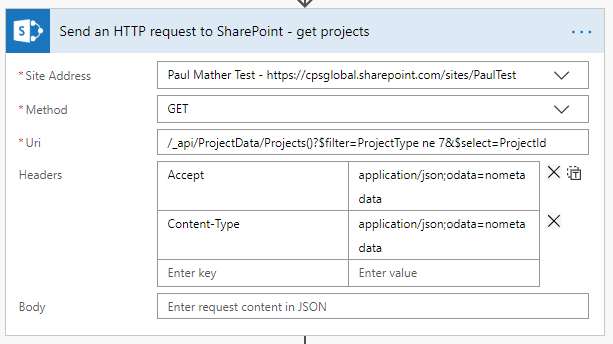 As you can see in this example, I’ve updated the SharePoint view to show the RAG icon in the Overall RAG column rather than the text value. 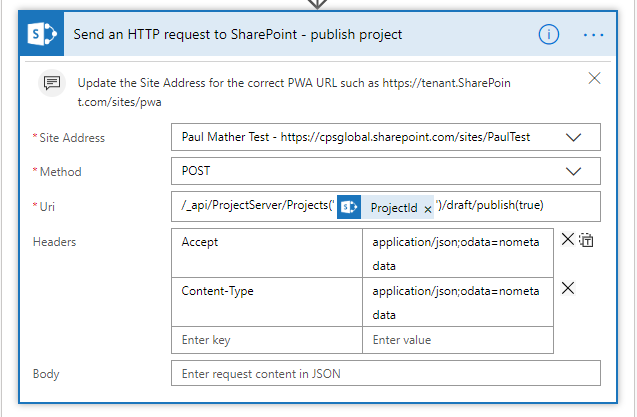 This is very simple with the column formatting options available with the SharePoint modern UI using JSON. 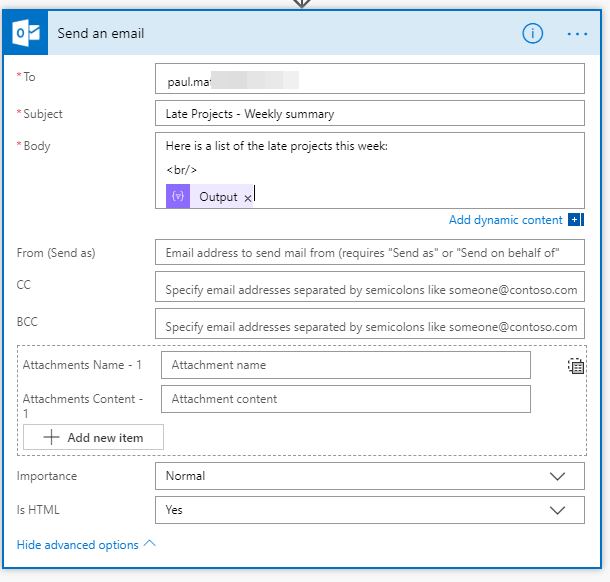 Another example of extending Project Online with low / no code solutions in Office 365. 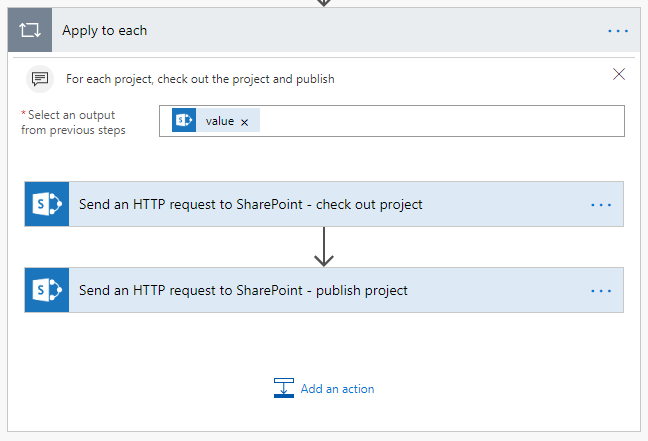 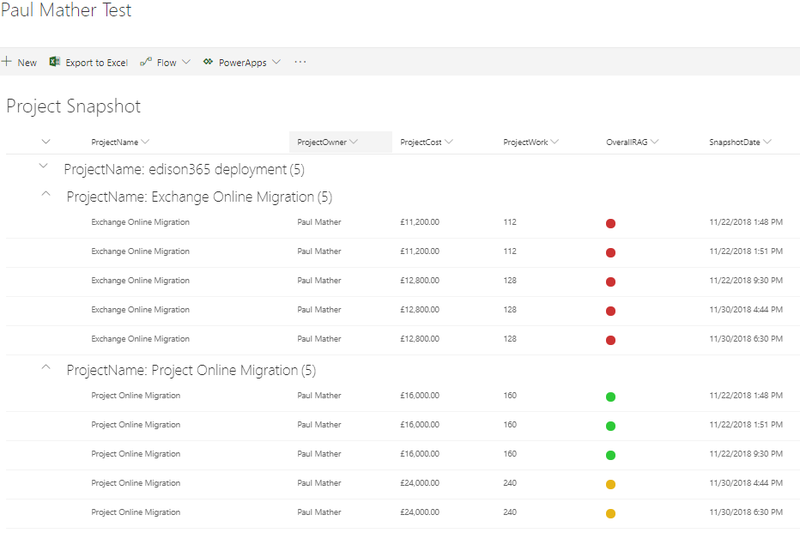 There will be further example solutions built for Project Online using Microsoft Flow in later posts. 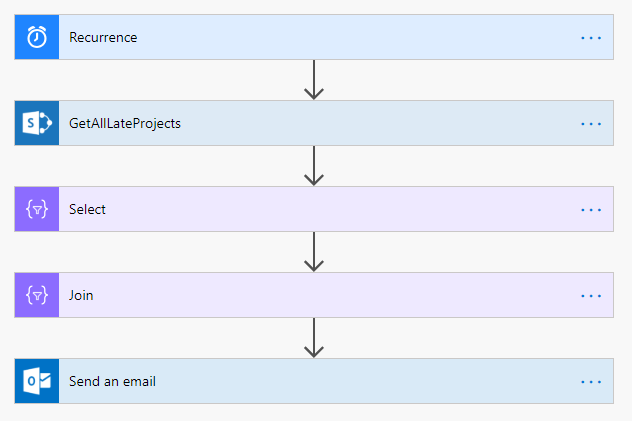 We then have a history of who triggered the publish all jobs and when. 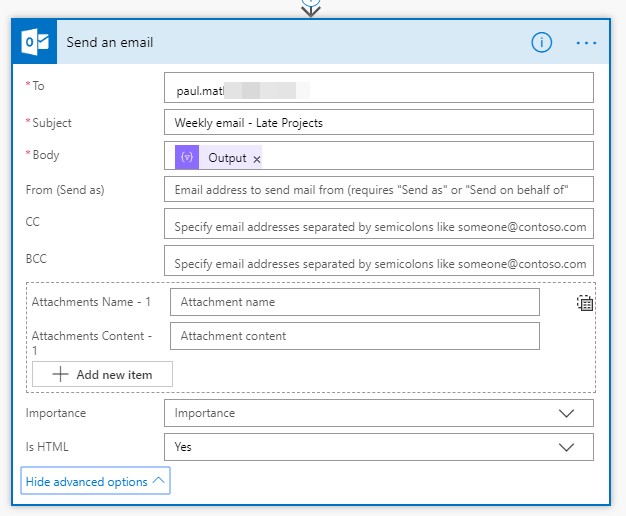 This post will hopefully give you some ideas on how Microsoft Flow can now really compliment Project Online and offer some scenarios for low / no code customisations. 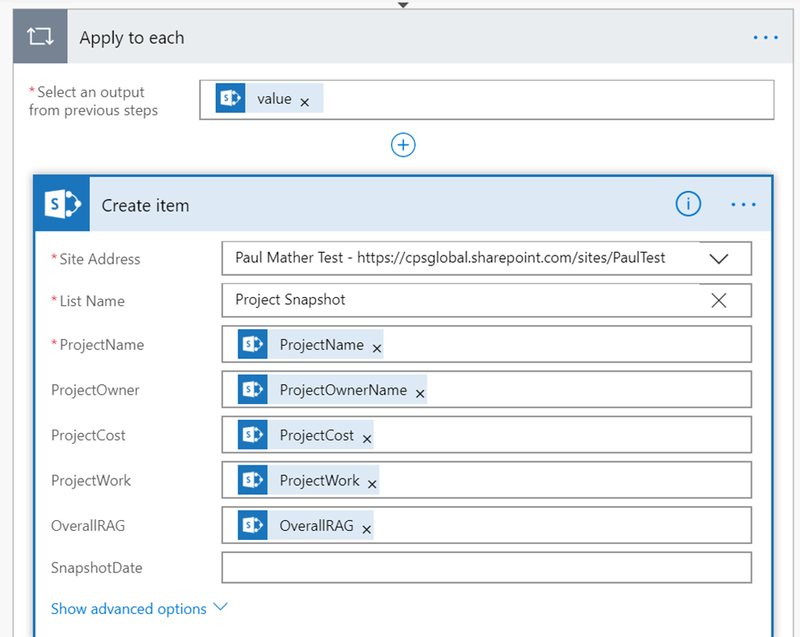 In the next post we will look at more examples for building low / no code solutions for Project Online using Microsoft Flow.